I’m sure you’ve heard of the concept of a bucket list. 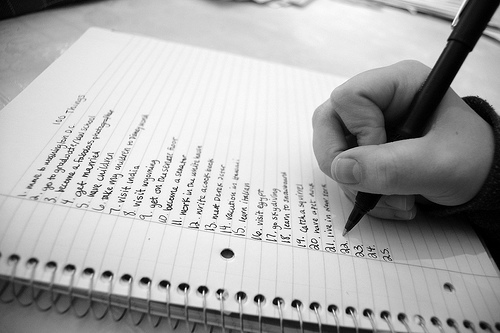 It’s a list of things you want to do before you die, especially if you were told you’d die within six months. This challenge was simply to write up this list. This was so much more difficult than I thought it would be! And I still have a list of only 12 things. Plus, I think some of them might not count, because it’s not necessarily something that could happen in six months… anyway I chose to still include them because they are important to me. But the thing that stuck out to me the most is that nothing on my bucket list has to do with my career or making a difference in the lives of others. This might sound a little crazy, but I feel like with my involvement in Alternative Breaks at UCSD, I have made a tremendous difference in the lives of many and left an amazing legacy already. While I would love to make that kind of impact on another level, I don’t feel the need to. I feel the need to take care of myself and those around me. Anyway, here’s what I came up with. 11. visit the East Coast, especially New York and Washington, D.C.
Rosetta talks about being told you only have six months to live, and using that as inspiration. Actually about a year and a half ago I was given a diagnosis that is not nearly as dire as just six months to live but definitely means that my future is more uncertain than if I were totally healthy, and that I may not have all the physical capabilities I do now in thirty years from now. Perhaps that’s why my mindset has changed in a lot of ways… things I thought were very important before no longer are so dire.